Dr. Melamed is trained to detect diabetic eye disease. • Fluid can leak into the macula, the area of the retina which is responsible for clear central vision. Although small, the macula is the part of the retina that allows us to see colors and fine detail. The fluid causes the macula to swell, resulting in blurred vision. • In an attempt to improve blood circulation in the retina, new blood vessels may form on its surface. These fragile, abnormal blood vessels can leak blood into the back of the eye and block vision. 1. Non-proliferative diabetic retinopathy (NPDR) is the early state of the disease in which symptoms will be mild or non-existent. In NPDR, the blood vessels in the retina are weakened causing tiny bulges called microanuerysms to protrude from their walls. The microanuerysms may leak fluid into the retina, which may lead to swelling of the macula (center of your vision). 2. Proliferative diabetic retinopathy (PDR) is the more advanced form of the disease. At this stage, circulation problems cause the retina to become oxygen deprived. As a result new fragile blood vessels can begin to grow in the retina and into the vitreous, the gel-like fluid that fills the back of the eye. The new blood vessel may leak blood into the vitreous, clouding vision. • Diabetes — people with Type 1 or Type 2 diabetes are at risk for the development of diabetic retinopathy. The longer a person has diabetes, the more likely they are to develop diabetic retinopathy, particularly if the diabetes is poorly controlled. • Race — Hispanic and African Americans are at greater risk for developing diabetic retinopathy. • Medical conditions — persons with other medical conditions such as high blood pressure and high cholesterol are at greater risk. • Pregnancy — pregnant women face a higher risk for developing diabetes and diabetic retinopathy. If gestational diabetes develops, the patient is at much higher risk of developing diabetes as they age. How is diabetic retinopathy diagnosed? Controlling your blood sugar is your best bet at preventing diabetic retinopathy from occurring. This includes proper nutrition, exercise, medication as prescribed from your doctor and insulin. Regular eye exams with your optometrist are key in spotting any changes in your retina. 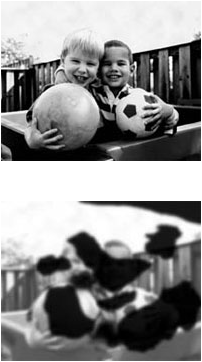 A retinal photo is also now standard of care to document and store a picture of the retina. We now carry the latest in retinal camera technology. 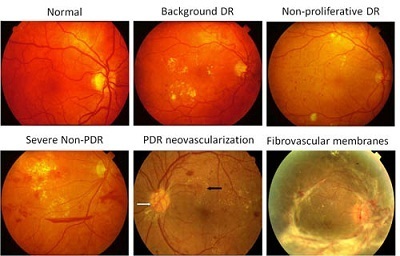 When blood vessel growth is more widespread throughout the retina, as in proliferative diabetic retinopathy, a pattern of scattered laser burns is created across the retina. This causes abnormal blood vessels to shrink and disappear. With this procedure, some side vision may be lost in order to safeguard central vision. Some bleeding into the vitreous gel may clear up on its own. However, if significant amounts of blood leak into the vitreous fluid in the eye, it will cloud vision and can prevent laser photocoagulation from being used. A surgical procedure called a vitrectomy may be used to remove the blood-filled vitreous and replace it with a clearfluid to maintain the normal shape and health of the eye.